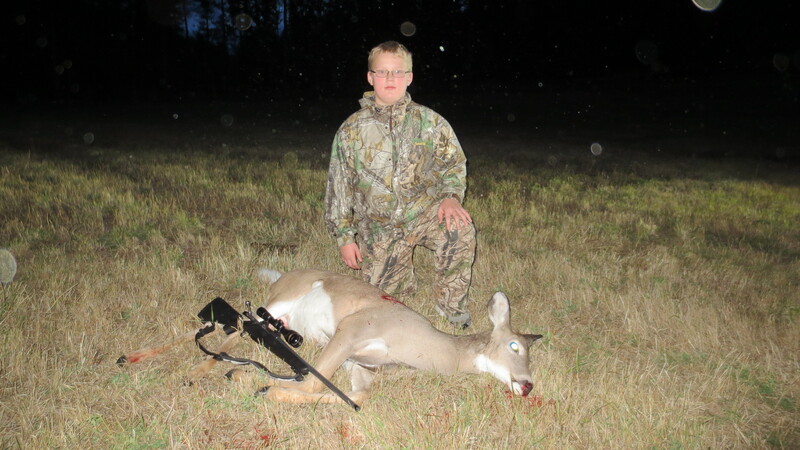 Just spoke to my son Deereman in Canada and he informs me my oldest Grandson has just shot his first deer ,a Whitetail Doe. Tyler was able to sit his hunting license this year which he passed and enables him to purchase tags for the various species available over there. Obviously he isn't old enough to own his own firearm yet but can hunt with his father which is great as it gets the younger hunters out there doin it. Deereman picked up a Tikka T3X in 243 Win and loaded up some 90 gr Noslar Accubonds at about 3000fps and very good accuracy. Over Elk season they hunted, seeing plenty of Elk but no legal bulls until a few days before the season ended. Two bulls crossed the road in the headlights of his pickup both 6x6 but one was huge but as legal shooting light was still 40 odd minutes away he had let them walk. Despite stacking the area out till the season ended those bulls eluded him. During there travels Deereman and Tyler had seen some Whitetails coming out in the top of the field close to there home and this evening after supper they ducked out for a quick look to see if they were still coming out. On arrival a vehicle was seen parked on the road close to where the deer crossed out into the field which you would have thought would have stuffed up the evening hunt but within minutes of arriving out jumps the doe and runs out into the field. Being Deeremans field it was ok to shoot so Tyler got out and walked to the rear of the truck , lined up behind the shoulder and at 100 yards let strip. The doe did a death run out into the field then collapsed. On dressing the animal out the bullet had entered just behind the shoulder and because of the angle the bullet came out in the front of the gut after hitting one rib. Well that is his first deer he will never get another first one, all I can say is I wish I had been there to be part of the action. The family is due over in about 3 weeks so we will be trying our best to get a Redskin for the boys while they are over. 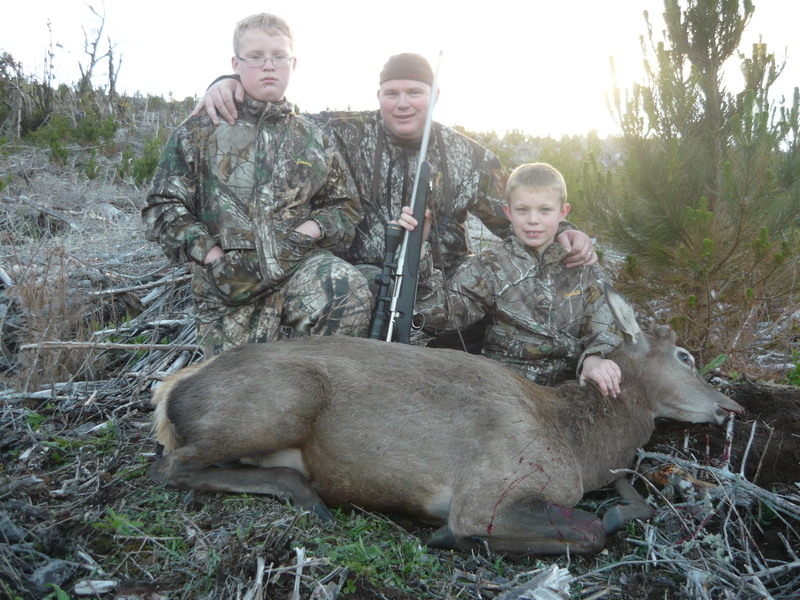 So neat to see the youngsters carrying on the interest in hunting as I passed it onto my son he is doing for his son's. Shootm, Tahr, outdoorlad and 25 others like this. It’s a proud moment to see your son remember everything you teach them.. squeeze the trigger and wait till it stops. Now we eat steaks this long winter. gadgetman, von tempsky fan, PERRISCICABA and 1 others like this. Nothing runs like a Deere, nothing drops em like a Browning. Nothing like nice whitetail steaks on the Barbie, you will have to put up with red deer steaks over here till you get back home. Man that looks like a big doe in comparison to a he ones that I've shot on Stewart Island in NZ. Just judging that on the size of those front legs! The bone looks way denser. Anyway good to see a young guy out there doing it. Easy carry back to the truck too gotta love that! Sideshow my son thinks it would have gone around 35 kg gutted. The whitetail over there are much bigger than the NZ ones and the further north you go the bigger they get. A few days back Deereman and family arrived for a three week stay as Deereman is best man at his best mates wedding. Well we did a few day trips last weekend with Beeman but didn't run into any animals. 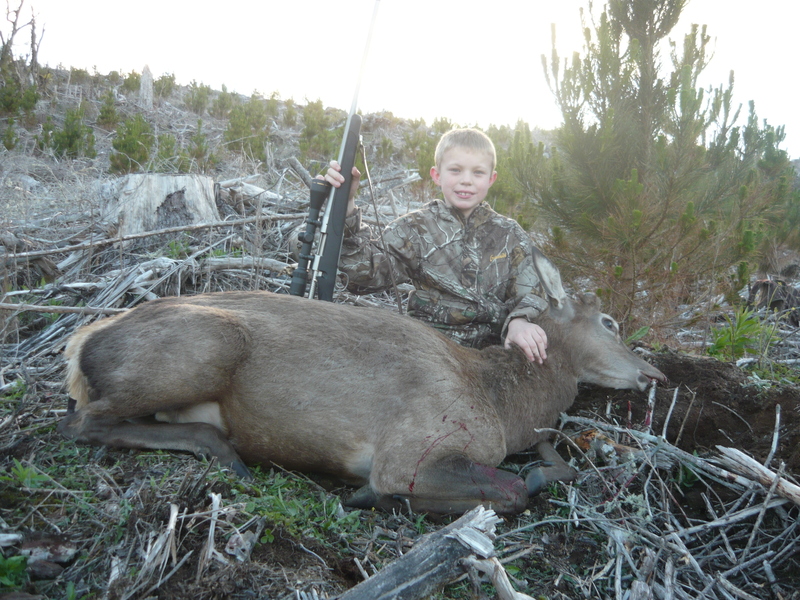 Grandson number two who is 10 is busting to shoot his first deer so we decided to head south for a looksee down Whirinaki way and see if there were any stray deer wandering about waiting to for fill a young lads dreams. Monday we packed and were gone by 11.30am and several hours later after checking a few likely spots we had the afternoon hunt sorted and camp set up. As the afternoon wore on we ready the gear and set off for the evening hunt. I dropped Deereman and Hunter off at around 6.30 pm so they could get into position and wait for the deer to move as evening wore on. Tyler and I sat and watched another spot within rifle shot of Deereman so we could hear any shots and go and help out if needed. Tyler and I had only been at our spot for 15 minutes and a shot rang out, man that was quick we thought. We packed our gear up and took off back up to there position. As it turned out they walked up to there look out and within a couple of minutes had two stags in sight. The first place they were going to shoot from proved unsuitable as Hunter couldn't get a steady aim so a quick move to a big stump fixed that problem. With the rest sorted and the range confirmed at 226 yards Hunter waited for the deer to broadside then once the crosshair was in the right place he let strip. Deerman heard the whack of the bullet, a 95 gr sst out of a 243 and seen the stag go down and feet go up. Hunter wanted to go check his kill but Deereman made him wait a few minutes to make sure it didn't get up and bolt, with no movement from the stag of they went to fetch Hunter's first deer. Not long after Tyler and I got there and we did the photo shoot and gutted the deer ready to drag it back to the truck. 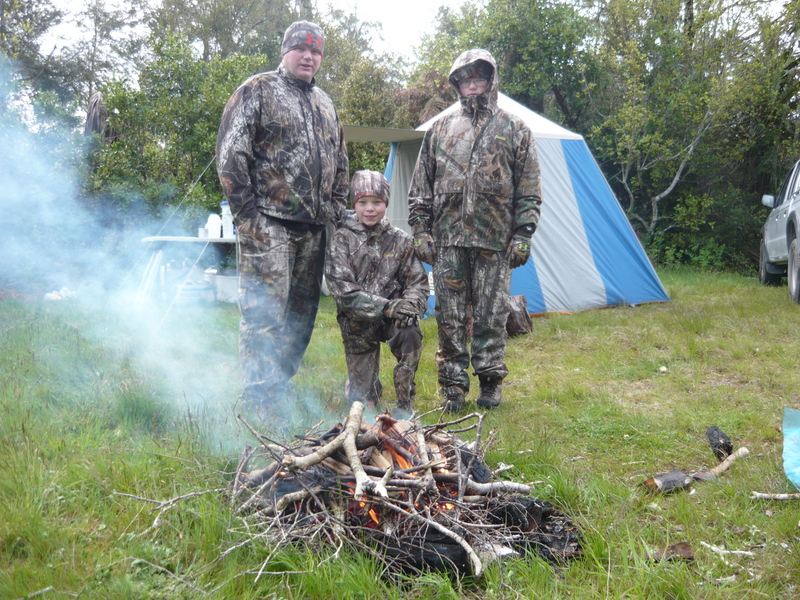 We loaded him up and got back to camp just on dark and hung the deer to cool, then a bite to eat before climbing into bed. I bet Hunter had some neat dreams that night. veitnamcam, PERRISCICABA, Marty Henry and 4 others like this. Excellent to see young fellahs coming through! Thanks guys we believe it is important to get them into the sport at a young age and teach them the safety aspects and how to hunt etc. They are the future of our sport and without them the anti's would rail road us and destroy the best sport ever.